Kelvindale Mills was built by John Barr at Bantaskin Street in The Butney c.1830, by the River Kelvin. It was burned down in 1841 and rebuilt, but had been demolished by 1895 when Thomson wrote his Memories of Maryhill. Adam must have caught the works just before it closed in the late 1870s. The textile industry was the main source of employment for women of the time. 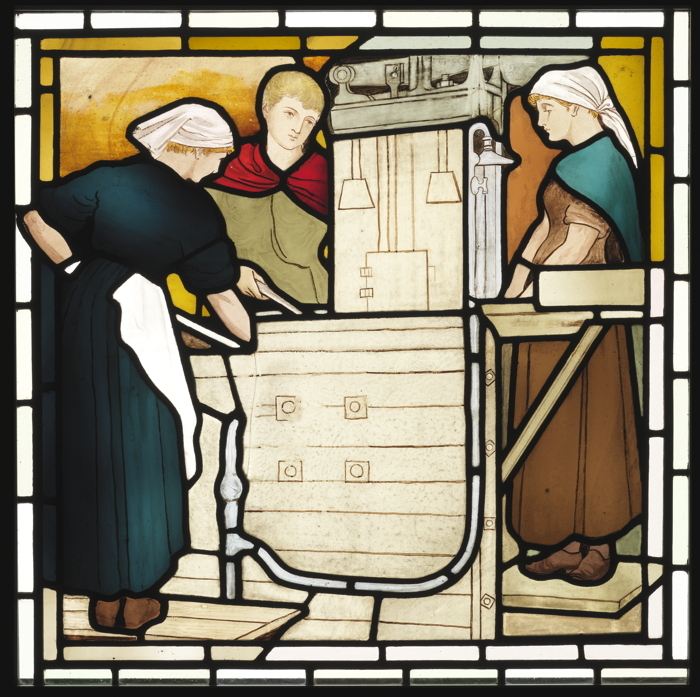 The women shown above are pre-treating cloth in a container with a water supply. They may be fulling (pre-shrinking) or dying the cloth. They stand on duckboards, and are wearing clogs, since the factory floor would be constantly sopping wet. Two wear headsquares as protective clothing, as they turn over the cloth with their poles.